Perched in the far corner of a run-down New England mall, the Red Lobster hasn't been making its numbers and headquarters has pulled the plug. But manager Manny DeLeon still needs to navigate a tricky last shift--just four days before Christmas and in the midst of a fierce blizzard--with a near-mutinous staff and the final onslaught of hungry retirees, lunatics, and holiday office parties. All the while, he's wondering how to handle the waitress he's still in love with, his pregnant girlfriend, and where to find the present that will make everything better. Stewart O'Nan has been called "the bard of the working class," and Last Night at the Lobster is a poignant yet redemptive look at what a man does when he discovers that his best might not be good enough. Stewart O'Nan is the author of sixteen previous novels, including City of Secrets, West of Sunset, The Odds, Emily Alone, Songs for the Missing, Last Night at the Lobster, A Prayer for the Dying, and Snow Angels. His 2007 novel Last Night at the Lobster was a national bestseller and a finalist for the Los Angeles Times Book Prize. He was born and raised in Pittsburgh, where he lives with his family. "A deeply moving novel about how we work, how we live, and how we get to the next day with our spirits intact. 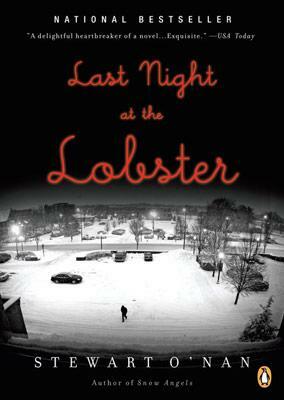 If there was ever a book that embodies what's best in us, it's Stewart O'Nan's Last Night at the Lobster." "[O'Nan's] vivid portrait of the Lobster ultimately conveys, somewhat miraculously, the warmth and comfort the restaurant provides Manny. . . . O'Nan's empathy for his characters is one of his greatest gifts as a novelist, and it is an impressive achievement that Manny's misplaced affection for Red Lobster is not risible, but tragic." "A masterful portrait. . . . The scope and emotional range of this poignant story are surprisingly narrow, as though O'Nan locked himself in a narrative box, tied one hand behind his back and then dared himself to make it engaging. The fact that he pulls it off is a testament to his precision and empathy." "In prose as wondrously spare as the lives of the characters, O'Nan exposes their pathos, a stripped-down fragility made all the more poignant by their fledgling efforts at resilience. These are dutiful characters, with modest dreams and deep humility, yet with a persistent, almost instinctive fortitude that enables them to get up each morning and try again."